Looking For The Best Security Chain For Motorcycles? Here’s a look at our favorites, including our top pick – Kryptonite New York Fahgettaboudit 1415 Bicycle Chain and New York Disc Bike Lock. Kryptonite New York Fahgettaboudit Chain 1415 and New York Disc Lock, 14mm x 60"
If you haven’t had your bike stolen, count yourself lucky—there’s no worse feeling than walking around the corner and seeing that empty space where your bike should be. 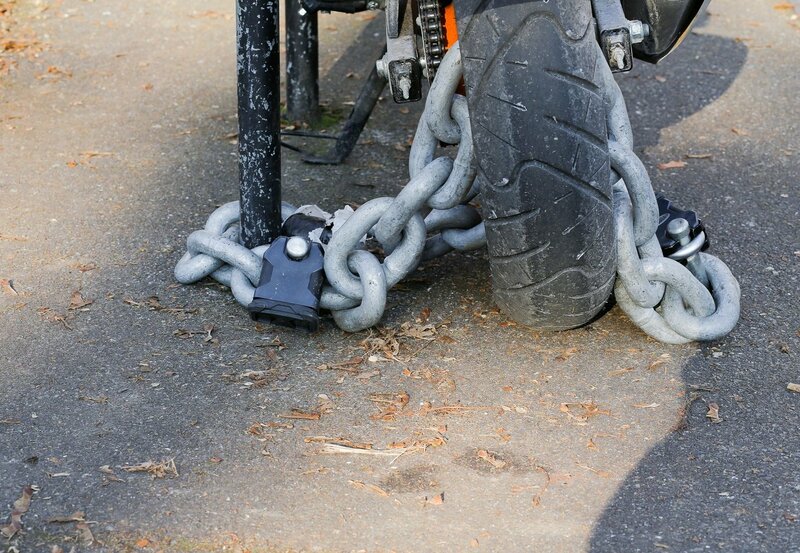 Using a security chain may not always be necessary, but it’s a must-have when you’re parking your bike in any at-risk areas. Steel chains – under no circumstances should you compromise and get a security chain that isn’t made of steel. Look for a minimum thickness of 10mm for optimal strength. Of course, thicker chains are even better, so it’s ideal if you can find something 11mm or thicker. Link structure – circular links are relatively easy to break, so you’ll want to look for chains that are square-shaped or hexagonal. Of the two, hexagonal are significantly stronger than square-shaped links. U-lock – you can’t beat the integrity of a U-lock. 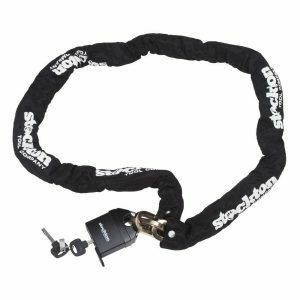 Look for a security chain that connects the loop with a U-lock for ultimate protection. Nylon cover – a nylon cover doesn’t help too much with security, but you’ll want it to protect your bike from getting scratched by the steel chain links. 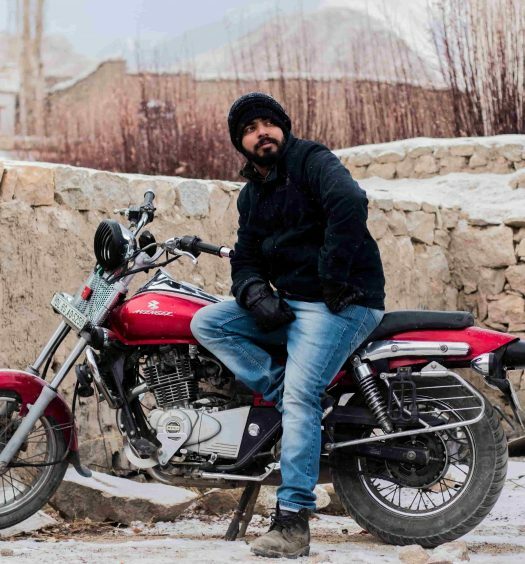 If you’re looking for the highest-rated and most widely recommended security chain for your motorcycle, look no further. 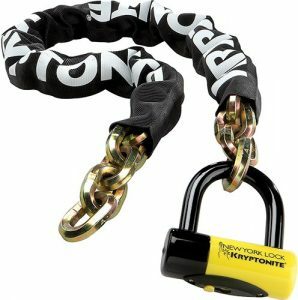 The Kryptonite New York Fahgettaboudit Bicycle Chain and New York Disc Bike Lock is built for maximum security in high crime areas. It offers a long five-foot chain that makes it easy to anchor your bike to other motorcycles or nearby objects, and you can loop it through bike components, too. You can feel safe with complete pick, drill, leverage, and cutting attack protection, and it comes with a durable sliding dust cover to extend the cylinder life for long-term use. The kit comes with 3 stainless steel keys, one of which is a night-key that’s lighted with a high intensity bulb and a replaceable battery. All Kryptonite locks come with the company’s $3,750 anti-theft protection coverage, too, so don’t forget to register that for even more peace of mind. 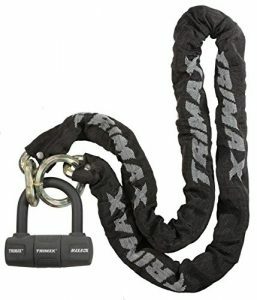 The Trimax THEX5060 is a T-Hex maximum-security chain with hardened 11-milimeter hexagon shaped links and a MAX60 disc U-lock. Like the Kryptonite lock, this one is also 5 feet long, so it’s got plenty of length to work with. The chain can withstand over 6 tons of pull force and 11 tons of cutting force, and the lock core design offers the highest degree of protection against lock-picking. 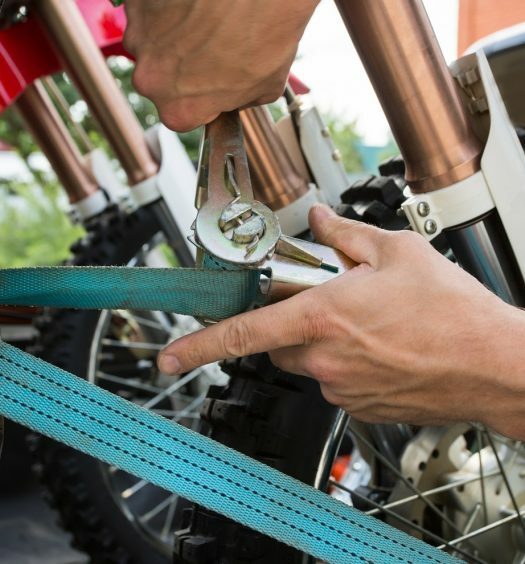 Don’t worry about the heavy-duty lock scratching your bike’s finish, either, as it has a NYLOMEX sleeve that protects your bike as well as the parts inside the lock for long-term use. You’ll get 3 keys, one of which has a mini flashlight for night use. 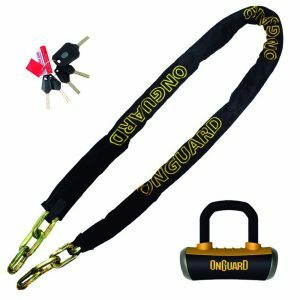 The OnGuard Mastiff series chain lock provides a high-security option in a light, compact package. It uses 10mm hex-link chains and square section bar links to defend against cutters and saws, and it utilizes Quattro and dual lock mechanisms to protect against lock pickers. All Mastiff locks employ vinyl coated large diameter ultra-hardened steel shackles with rubber-coated end caps, so they’re resistant to smash and hammer attacks, too. The nylon cover does a great job of protecting finished surfaces, and the rotating dust cover will protect the cylinder for long-term use. The package comes with four laser-cut keys and 1 TorchKey (a night key with a mini-light). It’s also backed by OnGuard’s anti-theft protection program, so you can trust that the company guarantees its products. 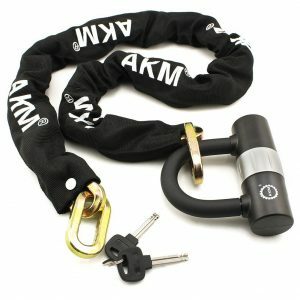 The AKM Security Bike Chain Lock combines the dependable security of a steel chain lock with the impenetrable U-lock. The chain is comprised of 24 10mm square links, all made from a hardened steel alloy that’s coated in non-toxic PVC material to avoid rusting. Combined with a double bow hitch, the lock is ultra-resistant to sawing, cutting, shearing, and breaking. The innovative U-lock design has a silver part that can be rotated to block and protect the keyhole action, preventing rust, dust, and lock-picking. Like all of the other locks we’ve discussed today, this one comes with a nylon protective sleeve to avoid scratching the finish on your motorcycle. The Stockton Tool Company 721 Security Chain Lock offers dependable security at an unbeatable price. If you’re looking for value, this is the one for you. It utilizes 10mm hardened steel square links to resist cutting and sawing and employs a secure anti-pick lock. The nylon protective cover will ensure you don’t get any dings or scuffs on your bike, and the six-foot chain should be long enough to secure your bike to any anchor. At the end of the day, I’d say the biggest determining factor will probably be your budget. If you can afford to get a high-end security chain, the Kryptonite New York Fahgettaboudit chain is hands-down the best you can get. If your budget doesn’t have as much wiggle-room, I’d recommend going with the Trimax THEX5060 lock. It’s significantly less expensive than the Kryptonite lock, but you’ll still get all of the necessary top-notch security features to protect your bike. I created All Around Bikes to help folks find exactly what they need for their motorcycles. If you have any questions about one of our guides, feel free to send me an email at steven@allaroundbikes.com I love hearing from the community! We feature the best motorcycle products & advice available. So you can focus on what matters most, planning your next adventure. AllAroundBikes.com is a participant in the Amazon Services LLC Associates Program.